This versatile new lightweight clay is extremely soft and easy to knead — yet it bakes rock-hard and is unbreakable. It's great for armatures. After baking, it even floats! It can be drilled, sanded, buffed, and painted with acrylic paints. Sculpey III and Premo! 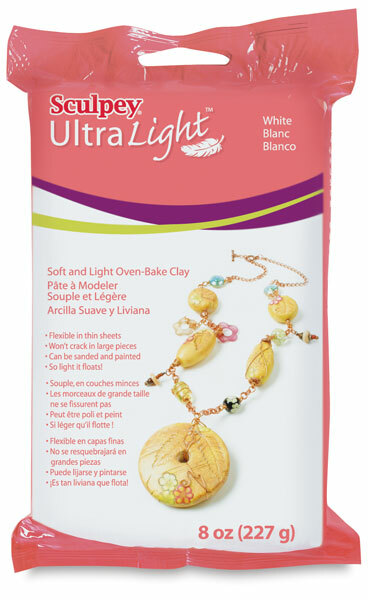 Sculpey polymer clays will chemically bond to Sculpey UltraLight when baked. It comes in an 8 oz (227 g) package. ® Sculpey is a registered trademark.™ UltraLight is a trademark. With so many Sculpey clays available it is hard to know which to choose. This video explains the difference among all the Sculpey "specialty" polymer clays, such as Sculpey Bake & Bend, Sculpey Bake Shop, Translucent Liquid Sculpey, Sculpey Moldmaker and Sculpey UltraLight. Learn about the unique attributes of each — so you know exactly which product to select for your next polymer clay project.